Gaia Higher Vibrationals currently call for Hue-manity Collaboration in refinement of grid points connections along all channels of resistance. Such channels of resistance have served their function and are resisting change in paradigm. Collaboration of Hue-manity will refine and align such resistance channels with Ascension protocols now in place. Understanding of this message occurs from Higher Levels only. 3D-4D analysis will fail to give such. As Higher Guidance is followed, understanding follows. Golden sparkles pervade all Gaia beings at all levels as full Higher Energetic activation has completed. This in readiness for completion of selected local protocols, individual, collective, and Higher Dimensional. Simultaneous freeing of all Hue-Being restrictions completes initial ascension phase. “Standard” protocols have been overridden and transcended. Exponential increase in Higher Dimensional visibles now proceeds. Essential grids are now in place and energized for rectification of all requisite Hue-manity up-steps. Cosmic stream assistance comes forthwith, at appropriate moment. Spiraling energies from Gaia Portals which are required for these up-steps will be embraced by sufficient numbers of Hue-Beings to allow Cosmic Upshift in frequencies. Manifestations likely will include instantaneous multi-body (physical, mental, and emotional) healings as well as resolutions of prior-viewed-as “impossible” situations. Major Gaia transformations commence with upcoming Cosmic stream influx. 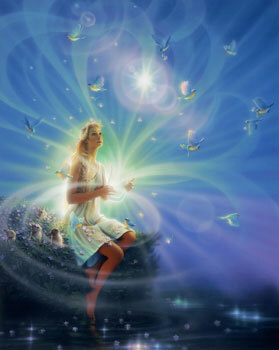 Sensational Illuminations are flowing from all Gaia Ascension portals after recent energetic uplifts. Such may be “sensed” by stepping into Higher Clarity Sensories. “Sensational” refers to the grand awakening moment of humanity, already preceded by Hue-manity. Prior acts of Light caregivers are manifesting results required for complete Ascension of all beings on Gaia, along with Gaia. The phrase, “Sparks are flying” (“Sparkles are flying”), is most applicable at this now moment. Transmutations of all Higher D portals proceeds at this moment, bringing each in precise alignment to assist individual communities adjustments to Higher Incomings. Frontier transformationals enter consciousness of group, community, individuals prepared for these. Those “unprepareds” also sense these transformationals and transmutationals. Signing of Higher Contracts nears completion for Hue-manity, as caretakers of these transformationals and transmutationals. All is proceeding as Hue-manity intention directs. Verification of renewed and amplified energetic structures for Gaia Ascension is now in progress. This final phase of Gaia preparation for Ascension occurs at this time as sufficient former paradigm structures have been removed and/or reset. Such verification requires no effort on the part of Hue-Beings at this time, as Gaia has complete administrative care of and responsibility for this phase. Hue-Beings will continue efforts at local levels as Guidance suggests. The “humanity” segment of Gaia population is now experiencing full and comprehensive inner and outer transformation, whether conscious [aware] of this or not. All has proceeded as desired at this point, and further adjustments are not anticipated. “Soaring” of Gaia vibrationals leads to stabilization of individual Hue-Being energetic patterns. All current updates are enabling the process of Ascension with Gaia, for Gaia, and all Gaia Hue-Being inhabitants. Galactic Presence within each now activates Higher Sense of Gaia partnership and Gaia responsibility, and connectivity to all Creation as Unity and Law of One components. What some would term “massive” energy changes are simply comprehensive DNA transformations for each Hue-Being, on all dimensional levels required for Gaia-collective Ascension. We of Éireport group recommend, at this time, patience with the Self, kindness for the Self, and acceptance (and embracing with Joy) of the Higher Energetics incoming to all. All of “Hue-manity”, as well as “humanity”, are receiving and sensing these energies, at this moment. “Standardized responses” to all situations on all dimensional planes are neutralized as Gaia nodes are requesting Ascended Collaboration. All attempts to utilize commonly-used measures will fail to bring in higher frequencies to the planet. Gaia assists all who are intending to Ascend with Gaia. All others will be moved to alternate ascension pathways. Repeat: all standardized response techniques are currently neutralized, and will fail to bring intended results.